An emergency boot disk can be very useful if system problems should occur which interfere with the Windows boot process. Your emergency boot disk should be created again when you make system changes such as adding a computer program. 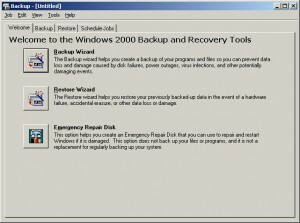 This page will describe how to create a Windows emergency boot disk for Windows 2000 and XP computer systems. Click on the “Start” button on the lower left side of the screen. From the submenu that appears, select “System Tools”. From the submenu that appears, select “Backup”. The Backup tool dialog box will appear as shown below. 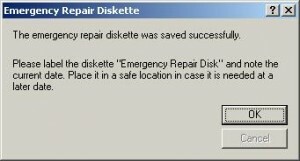 Click on the button next to the “Emergency Repair Disk” option. 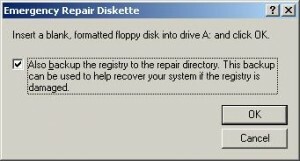 An Emergency Repair Diskette dialog box will appear allowing you you to put a floppy disk into your floppy drive. Check the checkbox next to the text that says “Also backup the registry to the repair directory…” as shown in the image above. This will backup your registry also. The system data will be copied to the floppy. A dialog box as shown below will indicate that the emergency repair disk was saved successfully. Label the disk indicating it is an “Emergency Repair Disk”, date, and name of the computer you ran this process on. Store the disk in a safe place. If you ever get into a situation where your system will not boot, you can use this disk to help you recover your system. This is a somewhat technical process but it begins by pressing the F8 function key while the system is booting which will provide some advanced booting options, one of which will allow you to try to boot using your emergency repair disk. It is usually much easier to recover a system that has an emergency repair disk.